Believed their son Xavier was dead, began to plan funeral. Soon learned that Xavier was actually alive, found out during a vigil w other families. Rushed to hospital to see him. “We arrived to his bedside with kisses and indescribable joy.” Paul. Tanya: “We are forever grateful” to the other family who sat at Xavier’s side, believing it was their child. 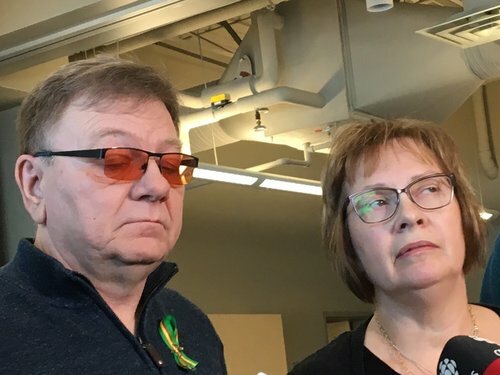 They feel deep sorrow for that family who learned their child was dead. Paul describes the multiple physics and mental injuries Xavier suffeeed to his spine, brain, etc, spent 62 days in hospital. Sought treatment for Xavier’s shoulder at Mayo Clinic in U.S., said Sask govt declined to subsidize but they went ahead and paid themselves. Also, some of the titanium screws in his fused spine broke, and he faces an uncertain prognosis. “We feel we are living in chaos and turmoil.” -Tanya. Paul has returned to work as an ER physician but it’s very difficult to cope. Tanya says they grieve for the families whose loved ones died. Consider themselves all part of the Broncos family. Paul says they appreciate all the support, and things will get better. Next to speak are Xavier’s grandparents Rick and Diane Armstrong. Say they’re bitter that Paul, an ER specialist, was sent home from scene not allowed to help, and bitter about the mixup of bodies. Angry that Xavier’s 9y.o. sister had to believe for three days that her brother was dead. 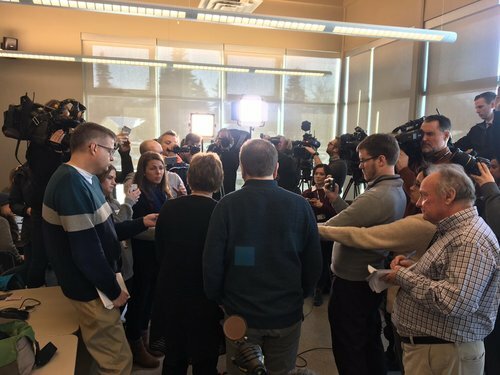 Angry Sask govt wouldn’t pay for Mayo Clinic surgery. Diane: “We are grateful to have Xavier with us.” Hopes the crash will not always define Xavier and their family. “Me. Sidhu, you are responsible for the injuries to Xavier. I will never forget his immense screaming” heard through three doors in hospital. Victim impact statements have concluded. Judge Inez Cardinal suggests adjourning until 10am Thursday. Lawyers agree. Court is adjourned. Lawyers will present arguments tomorrow morning. One statement which can following Xavier Labelle’s family was from former assistant Bronco coach Chris Beaudry, who was not on the bus that day. Says he suffered from anxiety and other grief. Some families expected to address media shortly. They plead with others to sign a national petition they support. It calls for trucking to be declared a profession, to hold companies accountable if warranted, etc. Prov, Fed govts recently met one demand of the petition when they pledged nat’l mandatory semi driver training, but more progress is still needed. 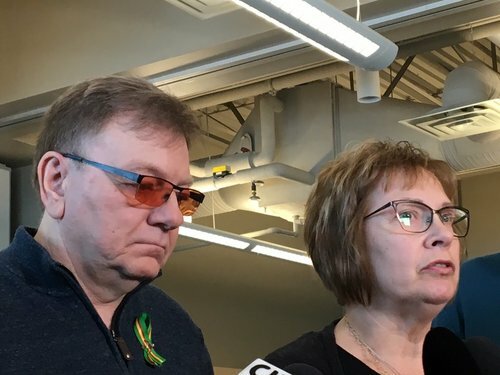 “We are devastated.” -Carol Brons, mother of deceased Humboldt Broncos athletic therapist Dayna Brons.